 With the same sharp penstrokes and brook-water prose he brought to Strong Drink, Strong Language (1990), novelist and linguist Espey (English/UCLA) carries on the droll memoirs about his boyhood in China. Material from Strong Drink first appeared during the 1940s in the New Yorker and was collected at that time in three books. This volume collects everything about China that Espey wishes to retain from his early works. Espey was born of Protestant missionary parents in Shanghai in 1913 and, with his elder sister Mary, spent the greater part of his life there until graduating from the Shanghai American school. The South Gate area where he lived was also home to a tribe of savage young vandals called alley brats, led by Lady Bandit, an albino girl who tormented the young Espeys with a variety of persecutions. One day little John, though forbidden to strike back, hurled a brickbat that left a permanent beauty mark Lady Bandit's forehead and caused her father to complain to his father about John's having lowered her bride price. When a bush grows in their yard, just on the spot where Father wants to build a tennis court, Mother curses the bush. The children later salt the earth around the bush and, when it dies, remind their mother of the fig tree in the Bible. 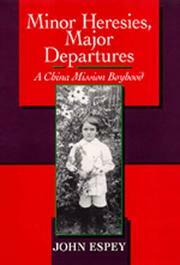 We follow Espey's days as a Boy Scout, his trips up the Yangtze, years at school, his meeting with Chiang Kai-shek, and his introduction to sins of the flesh: his school headmistress inveighed against nakedness and the evil of the body and instituted a pre-breakfast half-mile jog around the athletic field in hopes of subduing the Adamic impulse. All freshness and charm, though seventy years have passed since the times laid down.